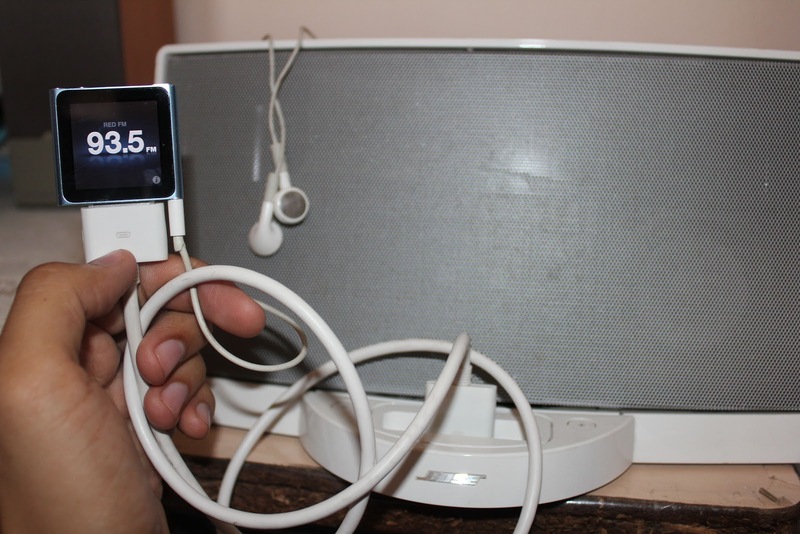 This is a 6th generation iPod Nano docked into Bose SoundDock Series I.
I am able to play FM Radio on the Sounddock using the iPod. I used this dock extension cable so that I dont have to physically place the iPod into the dock cradle. This allows me to access the headphone jack unhindered to plug in the headphones which act as antenna in the FM radio mode. My Bose SoundDock is one of the earliest modules from 2004 - the Series I model which charge the iPod through FireWire. So I am NOT able to charge my 6th generation iPod nano on it because the iPod nano series dropped charging through FireWire since 4th generation. Also I am not able to use the Bose SoundDock infrared remote control to change songs while my iPod is docked. My SoundDock does have GSM shielding though. FM Radio won't turn on until you plug in the headphones. I'll make certain to bookmark it and return to peruse a greater amount of your helpful data. A debt of gratitude is in order for the post.